Let me start by saying, Thanksgiving is my second favorite holiday (my favorite, of course, is my birthday – how can you not love your very own holiday?!) The true star of Thanksgiving is the food – although it seems each year the list of what we should eat gets smaller (no gluten, be vegetarian, no carbs, etc…). However, just because the focus is on the feast, doesn't mean you should slack on your personal appearance. What you wear on the big day should keep with the tone of your personal festivities – don’t show up in a dress and heels when the day is going to be filled with touch-football games and leaf-jumping and on that same token, please don’t show up to a dressed up dinner in your jeans and baseball cap. 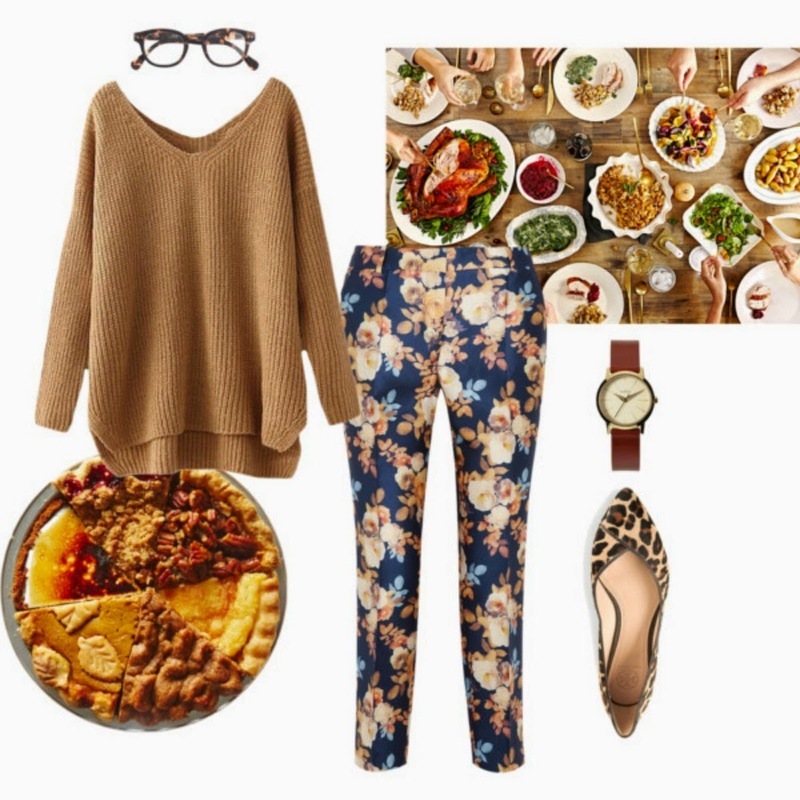 If you’re helping with food prep, or you’re having a laid-back dinner, an oversized sweater, skinny slacks and flats are an easy, comfortable choice. However, keep in mind that if you’re going to be in the kitchen, or if you have a house full of people, it can get quite warm and a sweater may become a bit sweltering. I would suggest to wear something under the sweater, so you can shed it if needed, or bring another shirt option to change into if the need arises. 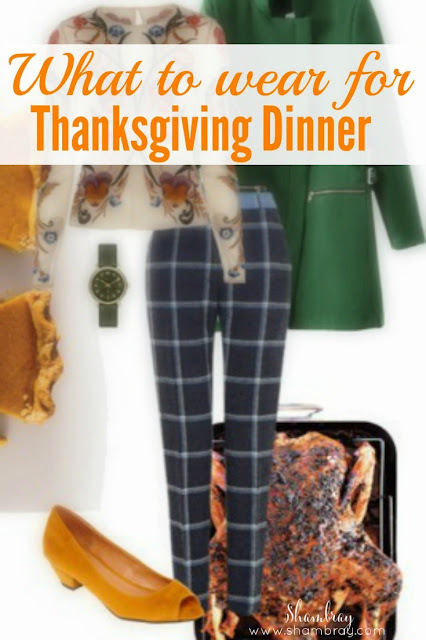 For those of you who host or attend more formal Thanksgiving dinners, you should opt for clothing with a little structure (not too much though, you want to EAT), but items that can be cleaned fairly easy in case you get stuck at the kids table or next to someone like me who will inevitably drop something at some point during the meal. 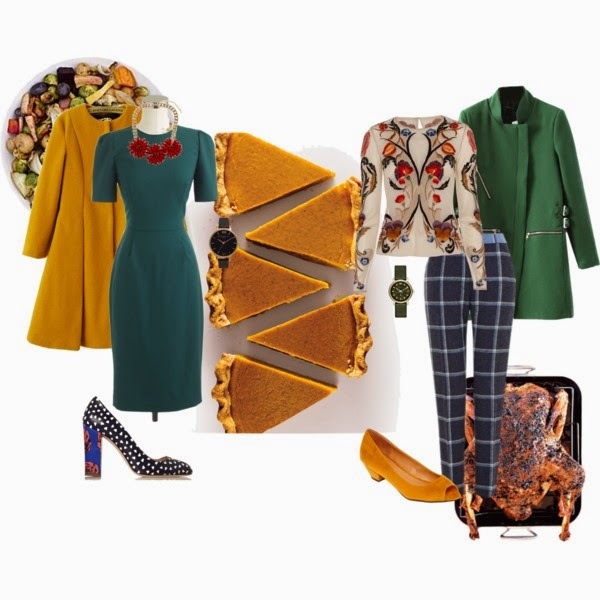 As you can gather if you've seen any of my previous posts, you will know I am all about whimsy in outfits, so I would recommend adding some fun with prints in your holiday attire. I like the idea of a printed blouse with printed slacks and bright pumps; or if you’re like me and love any excuse to wear a dress, I love the simple elegance of this J. Crew dress paired with some funky pumps and fun jewelry. Also, if you’re like me, your Thanksgiving will be cold and snowy – keep in mind coats do not have to be puffy and dull; counteract the dreary cold with a bright-colored coat and/or scarf. with those you love! Have a very Happy Thanksgiving!